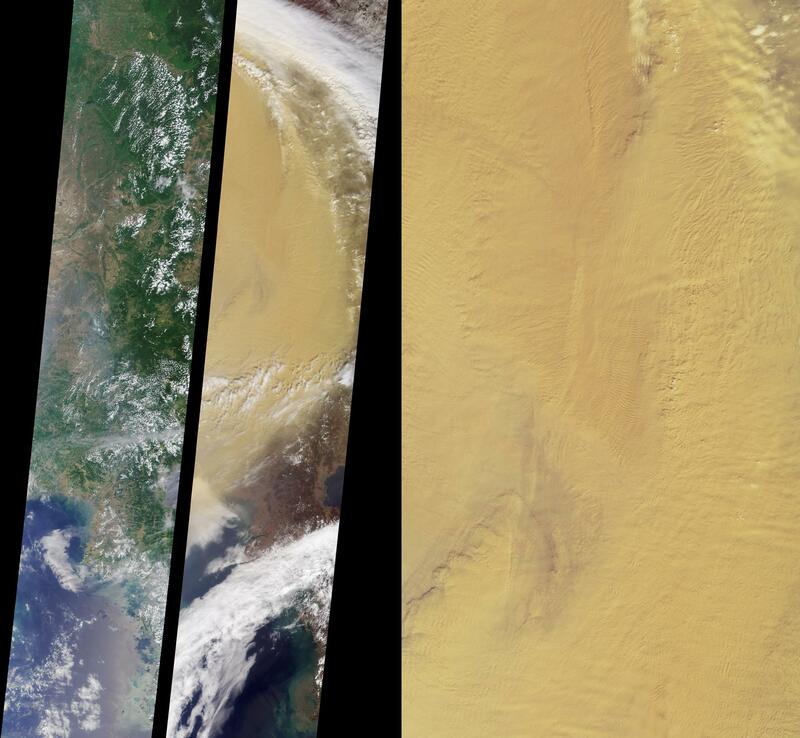 These MISR nadir-camera images of eastern China compare a somewhat hazy summer view from July 9, 2000 (left) with a spectacularly dusty spring view from April 7, 2001 (middle). The left-hand and middle images are from Terra orbits 2967 and 6928, respectively, and extend from central Manchuria near the top to portions of North and South Korea at the bottom. They are approximately 380 kilometers in width. Asia's desert areas are prone to soil erosion, as underground water tables are lowered by prolonged drought and by industrial and agricultural water use. 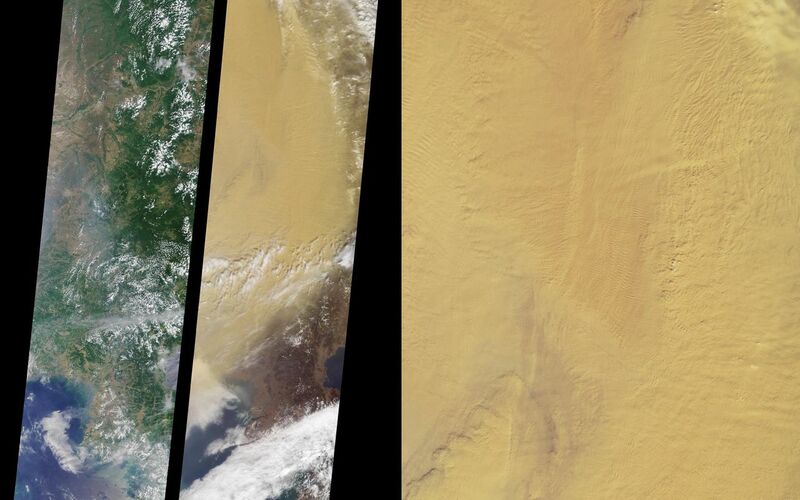 Heavy winds blowing eastward across the arid and sparsely vegetated surfaces of Mongolia and western China pick up large quantities of yellow dust. Airborne dust clouds from the April 2001 storm blew across the Pacific Ocean and were carried as far as North America. The minerals transported in this manner are believed to provide nutrients for both oceanic and land ecosystems. 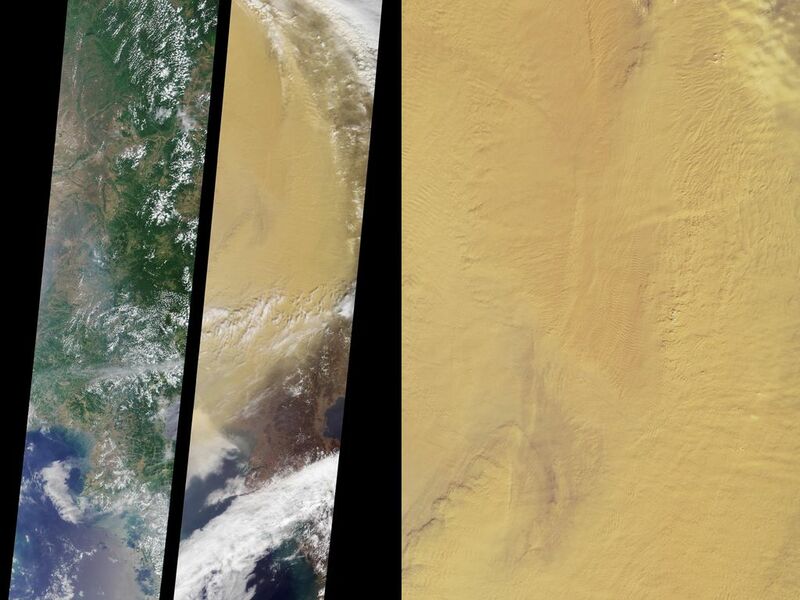 According to the Xinhua News Agency in China, nearly one million tons of Gobi Desert dust blow into Beijing each year. During a similar dust outbreak last year, the Associated Press reported that the visibility in Beijing had been reduced the point where buildings were barely visible across city streets, and airline schedules were significantly disrupted. The dust has also been implicated in adverse health effects such as respiratory discomfort and eye irritation. 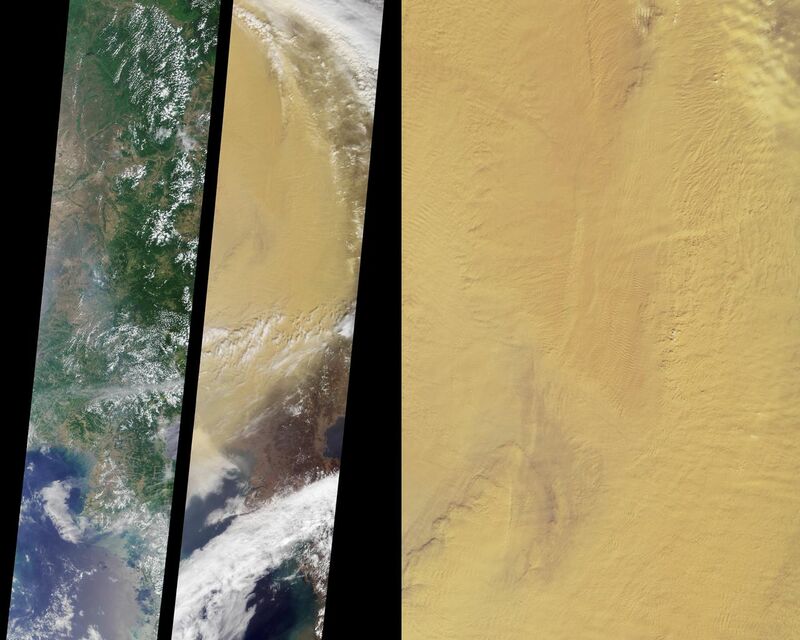 The image on the right is a higher resolution MISR nadir-camera view of a portion of the April 7, 2001 dust cloud. It covers an area roughly 250 kilometers wide by 470 kilometers high. When viewed at full magnification, a number of atmospheric wave features, like the ridges and valleys of a fingerprint, are apparent. These are probably induced by surface topography, which can disturb the wind flow. A few small cumulus clouds are also visible, and are casting shadows on the thick lower dust layer. Analyses of images such as these constitute one phase of MISR's participation in the Asian-Pacific Regional Aerosol Characterization Experiment, an international campaign aimed at studying the offshore transport of airborne particles from the Asian continent. For more about this international endeavor, see http://saga.pmel.noaa.gov/aceasia/.